Israeli soldiers invaded, on Thursday at dawn, the village of Burqa, north of the northern West Bank city of Nablus, and demolished a two-story home. Media sources said the soldiers, accompanied by bulldozers, invaded the al-Mas’udiyya area in Burqa village, and demolished the home of Moshir Suleiman Saif. 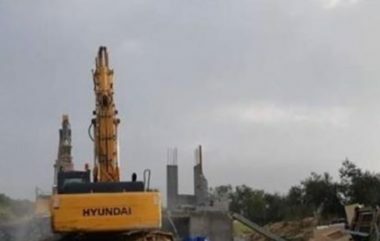 Ghassan Daghlas, a Palestinian Authority official in charge of Israeli colonies file in northern West Bank, said the soldiers demolished the home “for being built without a permit, in Area C” of the occupied West Bank. Daghlas added that the owner did not receive a prior notice for the demolition of his property. Also at dawn, the army invaded Kobar village, north of the central West Bank city of Ramallah, and demolished a home owned an imprisoned father, who was abducted with his son in December of last year, and is also the father a young man, who was killed by the army on December 12th, 2018. In related news, the soldiers handed demolition orders targeting four homes and structures, used by Palestinian farmers in Shoshahla village, in the al-Khader town, south of Bethlehem. The properties targeted with the demolition orders are owned by Ali Mahmoud Salah, Monther Salah, Mousa Ahmad Salah and Habbas Khalil Salah. The army claimed the properties were built without a permit from the “Civil Administration Office,” the administrative branch of Israel’s illegal occupation in the West Bank.